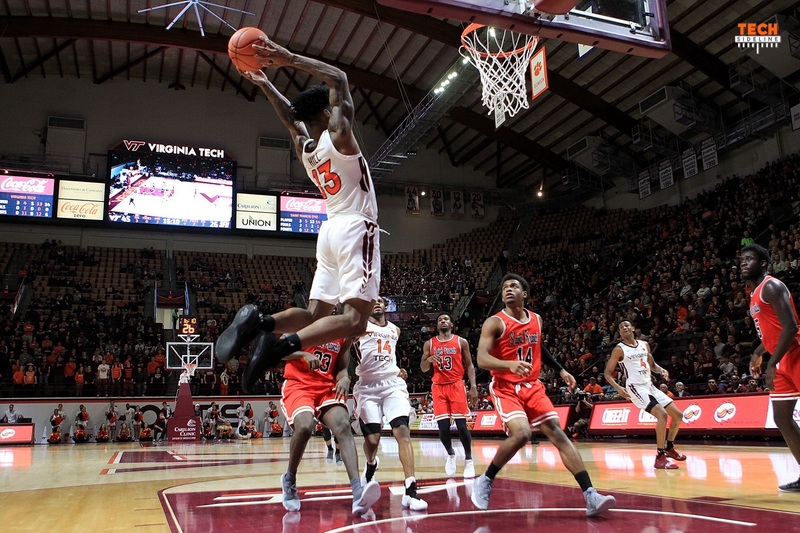 Virginia Tech got off to a slow start, but turned it up a notch in the second half in a 75-37 rout of Saint Francis (PA) in Cassell Coliseum on Saturday afternoon. The 13th-ranked Hokies are now 5-0 on the season, while the Red Flash fell to 1-4. Picked to win the Northeast Conference, all four of Saint Francis’ losses have come to ranked opponents. Senior guard Ahmed Hill paced the Hokies with 19 points. He was 7-of-11 from the field and 5-of-6 from three-point range. Senior forward Ty Outlaw came off the bench to score 15 points, and he was 5-of-9 from the outside. Sophomore guard Nickeil Alexander-Walker had 11 points, while senior point guard Justin Robinson added 10 points and seven assists. Buzz Williams was pleased with Outlaw’s contribution, and the fact that Tech was able to create so many three-point shots. As a team, the Hokies were 14-of-31 (45.2%) from three-point range. They were 27-of-57 (47.4%) overall from the field, and 7-of-9 (77.8%) from the free throw line. Though Tech was outrebounded 37-35 and surrendered 16 offensive rebounds, they still managed to outscore the Ref Flash 12-10 in second chance points, and they forced 20 turnovers, turning them into 21 points. Virginia Tech’s defensive performance was impressive. Besides forcing 20 turnovers, the Hokies held Saint Francis to just 15-of-58 (25.9%) from the field. It was the first time since a 99-34 win against Mount St. Mary’s during the 2010-11 season that Tech has held an opponent under 40 points. The performance would have been even better were it not for 16 Red Flash offensive rebounds that led to five put backs. “We’ve got to get to the point somehow where we don’t get in rotation so that we have a chance to have inside position to rebound because that’s our issue,” Williams said. Nevertheless, it was a good performance from the Hokies, who led just 23-20 with under three minutes remaining in the first half. At that point Tech closed the half on a 10-2 run to take a 33-22 lead into halftime. Then they began the second half on a quick 9-2 run to take complete control of the game. Virginia Tech returns to action on Tuesday night when they go on the road to take on Penn State in the ACC/Big Ten Challenge. Tipoff is scheduled for 7pm, and the game will be televised by ESPN2. The Nittany Lions are 3-2 on the season, with losses to DePaul and Bradley. The Hokies entered the game ranked 13th in the AP poll and 14th in the USA Today Coaches poll. Justin Robinson passed Al Young into fourth place in career assists at Virginia Tech. He now has 473 career stats. Robinson scored 10 points in the game. He now has scored in double figures in all five games this season. Ahmed Hill passed Jay Purcell and former teammate Zach LeDay into 40th place in career scoring at Virginia Tech. Hill scored a team-high 19 points. Nickeil Alexander-Walker scored 11 points, his fifth game in double figures this season. Ty Outlaw scored a season-high 15 points, his first game in double figures since scoring 16 points against Wisconsin in the NCAA Tournament on March 17, 2017. The 37 points allowed to Saint Francis is the fewest points allowed by the Hokies under Buzz Williams and the fewest since allowing Mount St. Mary’s 34 points in a 99-34 win over the Mountaineers on Jan. 2, 2011 in Cassell Coliseum. The Hokies are off to their first 5-0 start since the 2012-13 season when Tech opened the season 7-0. The Hokies dished out 20 assists on 27 made baskets. It is the third time in five games this season that Tech has 20-or-more assists in a game. How about a Wayne Purcell reference.